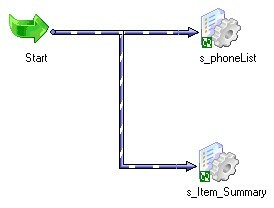 The tasks are connected by workflow link. You create a workflow for each session you want the integration service to run. or to ensure that targets load in a set order. The integration service uses the instructions configured in the workflow to run sessions and other tasks. You create and maintain tasks and workflows in the Workflow Manager. Powercenter - How to schedule a workflow ? In the Workflow Manager, you define a set of instructions to execute tasks, such as sessions, emails, and shell commands. This set of instructions is called a workflow. When the PowerCenter - Integration Service runs workflows, you can monitor workflow progress in the Workflow Monitor. You can view details about a workflow or task in either a Gantt Chart view or a Task view. You can start, stop, and abort workflows from the Workflow Monitor. The Workflow Monitor displays workflows that have run at least once. By default, when you link both sessions directly to the Start task in the workflow manager, the integration service runs both sessions at the same time when you run the workflow. If you want the Integration Service to run the sessions one after the other, connect the Start task to one session, and connect that session to the other session. Click Tools > Workflow Designer. Click Workflows > Create to create a new workflow. When you have a workflow already open, the Workflow Manager prompts you to close the current workflow. Click Yes to close any current workflow. The workflow properties appear. Click the Browse Integration Service button to select an PowerCenter - Integration Service to run the workflow. The Integration Service Browser dialog box appears. Select an Integration Service and click OK.
Right-click the Start task in the workspace and select Start Workflow from Task. Or right-click the workflow in the Navigator and select Start Workflow. The PowerCenter - Workflow Monitor opens and connects to the PowerCenter - Repository. By default, the workflow is scheduled to run on demand. The Integration Service only runs the workflow when you manually start the workflow. You can configure workflows to run on a schedule. For example, you can schedule a workflow to run once a day or run on the last day of the month.